Homemade Italian Minestrone Soup – Earlier this year, I was curious to see what I could find in the fresh food and market section of our local Wal-Mart© Supercenter store on Worth Avenue. The local Wal-Mart® store is located at 14000 Worth Avenue, Woodbridge, VA 22192. 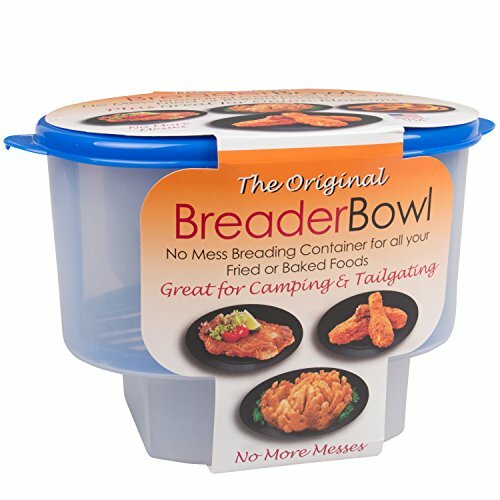 Granted, Wal-Mart© is not the first place I think when it comes to food and grocery shopping but I was pleasantly surprised. Although I did not spend too much time in the back corner with the canned goods, I did take time to investigate every corner of the fresh food department. I was, however, quite pleased to find a small corned beef brisket. Usually, they are rather large…which is not a problem because they do shrink some during the long cooking process but when you are aiming for fewer servings, a small brisket fits the ticket. The Corned Beef dinner was quite good but why waste the tasty cooking broth? How could I transform it into yet another dinner? Technically speaking, one would use chicken or beef broth to make Minestrone but who would know? The cooking broth became the base for a Italian Minestrone Soup. It was the easiest thing to do when you consider that many of the leftover vegetables from the New England boiled dinner could also serve as ingredients in the soup. I drained the broth to remove most of the mustard seeds and it was good to go! 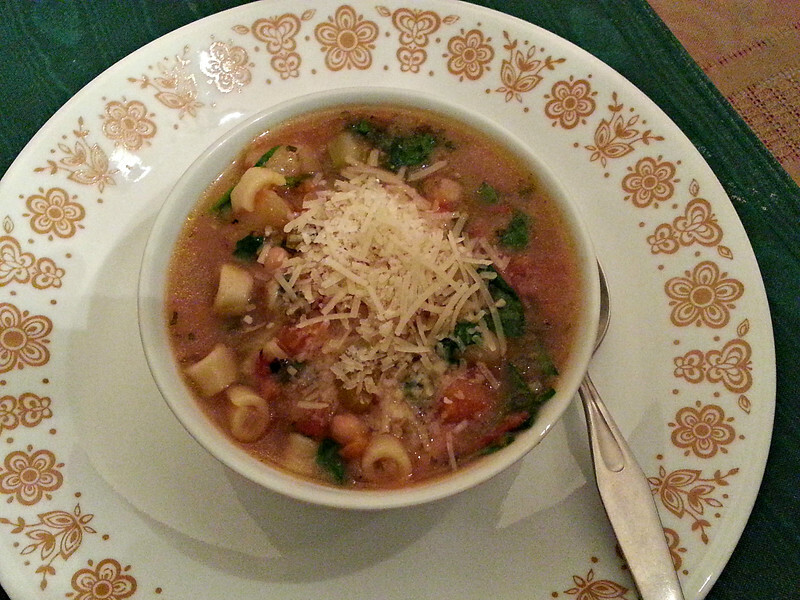 The remnants of a corned beef dinner were transformed into a heart warming, quite authentic, Italian Minestrone soup. 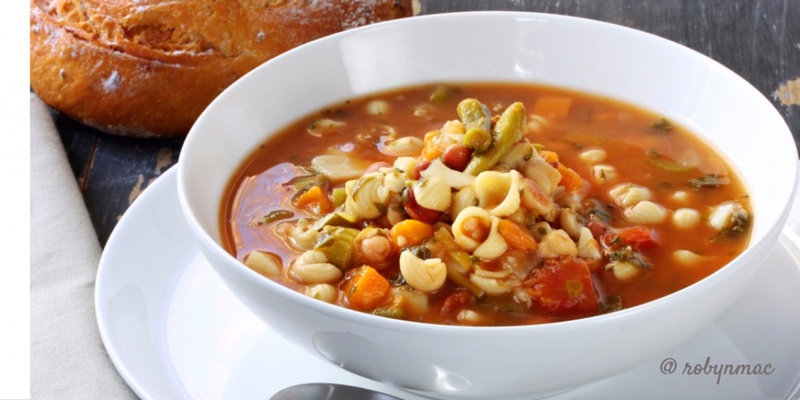 Minestrone is basically a delicious concoction of everything one might find in the kitchen. Add tomatoes and garlic and ecco! Zuppa. No, its not quite that simple but it just about describes what I did. I raided my pantry and the refrigerator shelves for a variety of vegetables, beans and pasta. Here is how I prepared my homemade Italian Minestrone Soup. With a slotted spoon, carefully remove the remaining cabbage wedges, the pieces of carrot and the onions. Once you have taken out all the largest pieces of vegetables from the Corned Beef dinner, set them aside. They happen to be among the “required” ingredients for this “let’s clear the pantry” type soup. Soupe, Suppe, Cyna, Zupa, Sopa: Check out all our soup recipes! The only ingredients I did not have on hand were the Ditalini (from Barilla®) and a bag of baby spinach. It’s your soup so you can use elbow mac or orzo. If you have kale in the fridge, you kale instead of spinach. I used a dutch oven to make the soup but it could just as easily be prepared in a crock pot. Sauté the diced onions and sliced celery, along with the Italian herbs (to taste) in 2 -3 tablespoons of EVOO until soft and taking on just a hint of color. Add the garlic, combine well and sauté a minute more. Lower the temperature to simmer and carefully add the can of tomato pieces and about 1 cup of the stock. Season to taste but remember that your broth is already well seasoned. Stir to combine all the ingredients well before adding the remainder of the stock. Add cubed potato pieces and simmer for about 30 to 45 minutes. Add the zucchini and 1 cup of Ditalini pasta and cook until done Al Dente – about another 10 minutes. I often cook the pasta seperately so they do not turn to mush and absorb the soup broth. Add can of beans just long enough to heat through. No need for bean mush. Give the spinach a rough chop and add to the soup about 5 minutes before serving. Ladle piping hot and top with grated Parmesan. Did I forget to mention that a fresh crusty baguette, garlic bread or rolls are a must to go along with the soup? A glass of vino helps too. NOTE: *Pressure cook the picnic shoulder ham until pull apart tender, transfer to a foil plan, place on the charcoal grill to”barbecue”.